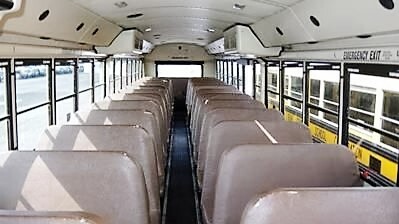 After my share of Dad's estate, I purchased Brunhilde, an 03 Thomas HDX Transit from Midwest Transit, Kankakee, IL. (Do I get a commission for the shoutout?) She had 128K on the clock and all 6 tires were almost brand new with very deep treads. I drove her from Kankakee to Billings, MT, via Iowa 80 and Minneapolis. I was advised that I would get about 5-6 mpg on the trip. Surprise! I averaged 7.5 mpg. The fuel gage sender is wonky, so that will be replaced later. Approximately 1400 lbs of seating has been removed and transferred to the scrap yard at a whopping 1¢ per pound. 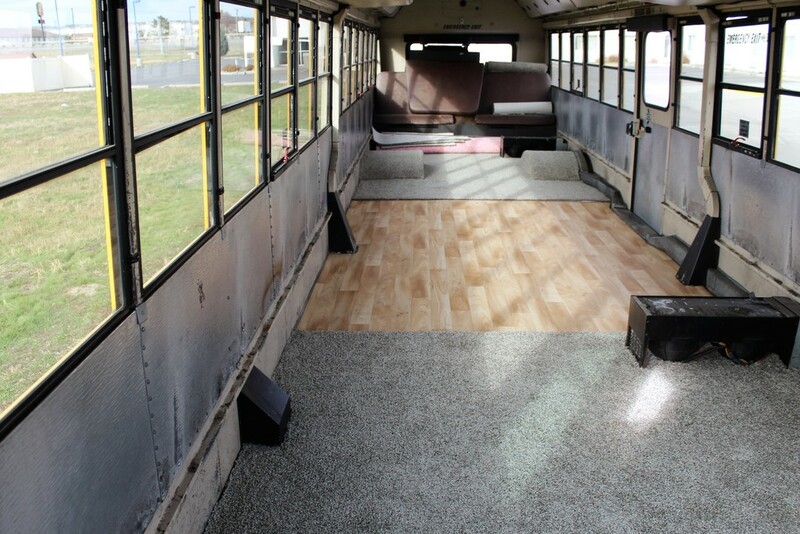 Once cleared, carpeting and linoleum have been laid down. This adds a bit of insulation. I will have the undercarriage sprayed later. I had a custom made bed frame constructed to hold the full-sized mattress. This partially straddles one of the wheel humps and the rear heater and has 18" of clearance. I left the seats over the doghouse. Comes in handy when getting dressed in the morning. 1" rigid foam insulation and a propane heater will be installed on the 3d when my SSDI comes in. That, and a new T-stat. The engine heat (idling) doesn't get above 100º with the old one and Montana's winter temps can dip well below freezing. Don't start with that, Tippyman. I tried to post pix, but they didn't upload. Cool conversion! it looks similar to mine. I like conversions that still "honor" their previous life. I purchased 8 4x8 1" rigid foam insulation panels the other day. They are double-foil faced, so the R value is around 6. If they were only single faced, the R value would be around 3.9. There IS a 1" gap between the bottom of the panels and the rail where the seats were secured, but that is inconsequential. I have to do some fancy trimming to get the rear panels around the doghouse seats and the AC hose runs, but I'll get some poster board to make the patterns. And, for those demanding pictures, YES, there will be pix AFTER the panels are installed. Patience, please. FINALLY got the Silent Witness removed from Brunhilde. It required a Sawzall and a drill to get the base off the dash. Three bolts rusted in place and a screw that was stripped. The overhead camera was too simple; three screws and a pair of wire cutters and it was gone. On the base, I'll retain the 12VDC connection, but that aberration is GONE! Under the base was 13 years of accumulated dirt. I might need a stick or two of C-4. Got word back (finally) from the South Bend School Corporation (previous owner), only to find out that Brunhilde ws a HANGAR QUEEN for the year before I got her. Quite naturally, it was viewed as a convenient source of spare parts for other buses. Which probably explains why I must replace fuel filters.